Sound it out…ewls-kuck-sk. 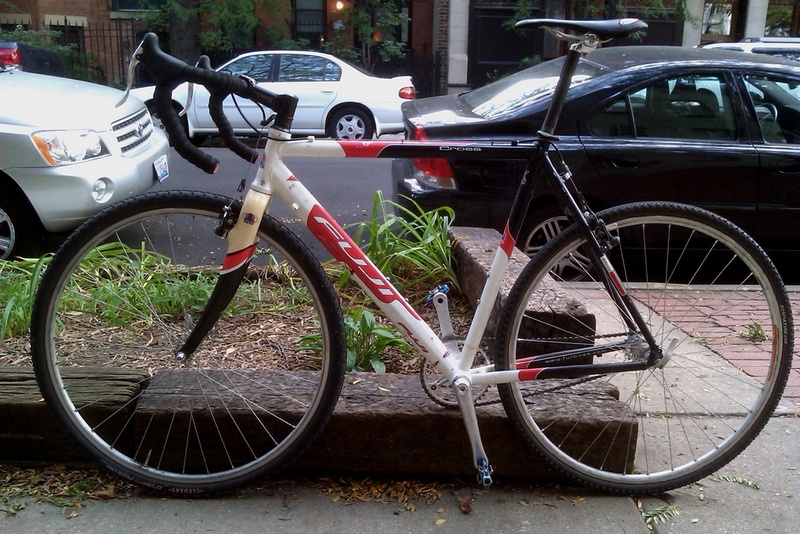 Or, Official Unofficial Illinois State Single Speed Cyclo Cross Championship. Ewlskucksk is easier to say. This is a big deal. What is on the line? Check out the prize list here. Yes, you read right, not just the OUILSSSCXC on the line but an entry into the SSCXWC…scuks-wic, (Single Speed Cyclocross World Championships) in San Francisco along with round-trip airfare! Damn! I’m all over it. Problem is, so are a lot of faster dudes and dudettes in the Chicago area. OK, so I don’t really have a plan, more like lots of hopes. I hope a certain person rolls a tubular. I hope another certain person doesn’t show up on their SS SuperX. And I hope someone else keeps trying to race cross on a SS mountain bike. Lastly, I hope it snows because that would be rad. After getting my Cannondale CAAD9X stolen last month I cobbled this together from stuff on my back porch. I think out-of-pocket I’m into it about $100, which may be too much for a dirt bag single speed bike. See you in DeKalb for ChiCrossCup #2 and the OUILSSSCXC!